Because solar panels are designed to accumulate as much light from the sun as possible, they're typically very dark in color. It makes them more efficient, but also kind of an eyesore, minimizing their adoption. So researchers at the University of Michigan have developed what they believe to be the world's first semi-transparent, colored solar panels. After all, solar panels produce energy that's completely free, but who wants to cover every inch of their home in giant black panels? 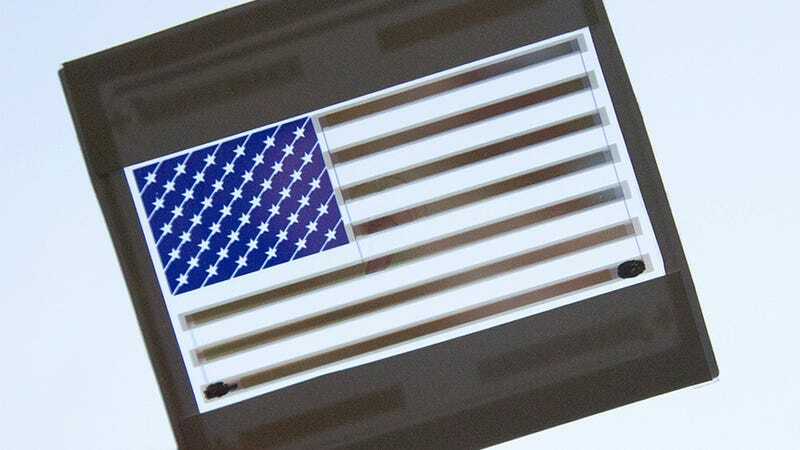 In the palm-sized American flag pictured above, the tinted stripes and field of blue are all energy-producing solar cells. And were it increased in size to a meter on each side, it would generate enough electricity to power a fluorescent lightbulb. What's particularly important about this innovation is that the colors weren't created by adding dyes or a film that can obscure the light hitting the panels. Instead, the colors are produced by the mechanical structure of the solar cells themselves causing them to reflect different wavelengths depending on the thickness of the semiconductor layer.